The process of updating a Guiness World Record can be a lengthy one. It is not sufficient to claim a record. It is not sufficient to point to a webpage regardless of what that page says. You need a variety of independent, verifable, trustworthy sources. Even to renew/update a record, that takes time. As such, we skipped right over the 21 year record and landed at the 22 year record by the time that process completed for our latest record setting approval. There are always naysayers who say the are an older guild. 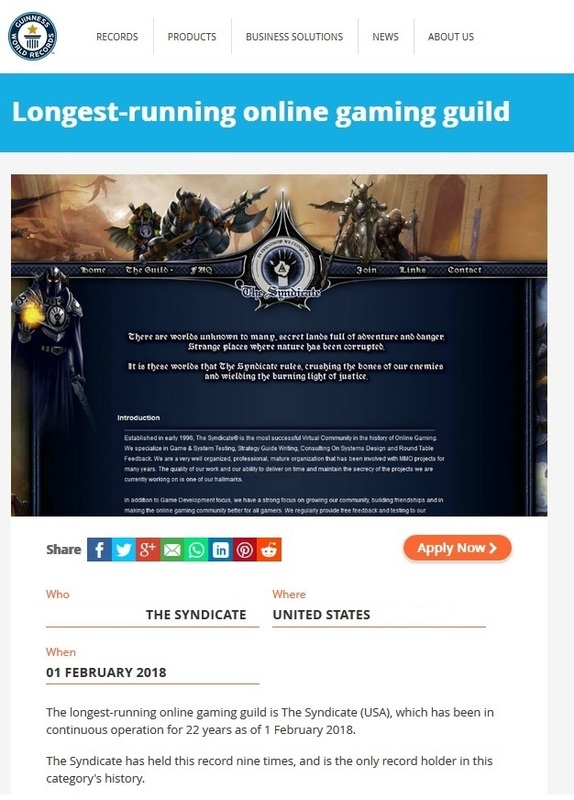 However, The Syndicate doesn't claim to be the first guild. We hold the record for the longest, continuously operating guild. Some old guilds have disbanded/retired and then come back years later (or someone came out and used the name claiming lineage). That doesn't count. Some guilds merged with others along the way, adjusting their name but trying to claim lineage back to the start of the first entity. That doesn't count. Continuous opertation.. as a single entity.. no taking a break... no merging... no retiring... no imploding and reforming. Continual opertaion for 22+ years.. as an entity... is what this record is all about.